We were delighted to welcome Company SJ to Project recently to develop their production Beckett in the City: The Women Speak. Below is a note from the company about their time here. 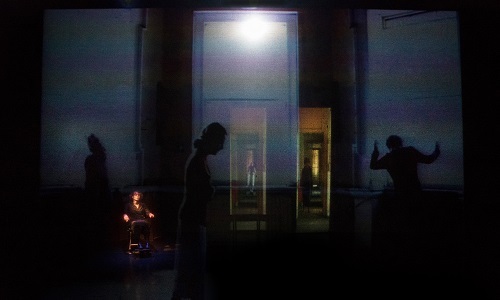 Company SJ would like to express huge appreciation to Project Arts Centre and Dublin City Council for facilitating this exploratory week, without which our work of installing Beckett in the City: The Women Speak into a theatre space would not have been possible. We worked to re-configure the individual aesthetic components of the production for this new black-box space; in fact what we achieved was to develop a whole new perspective and depth to the material and to re-frame the concept in a more distilled way. It is essential to us, as to all theatre artists that we are given the opportunity to play with the technical and aesthetic aspects of our design within a theatre, as opposed to rehearsing in a studio without this facility. When you are working on a project-based funding model, you really do not get to work out practically what you have conceived of theoretically. This piece was created in 2015 in the Halla Banba, a stripped back, derelict, Georgian building in Dublin’s inner city. However, I also conceived and designed it to be presented in a more traditional theatre setting, utilizing the filmed projections from the city. This week allowed us to re-imagine the stage itself as both a screen, and as a live performance space. The imagery moved between the two. 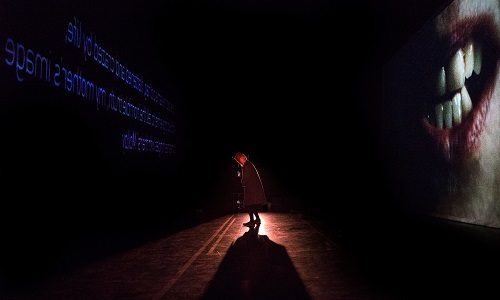 In an aesthetic blending of live and filmed performance, of past and present, of the buildings and spaces of Dublin’s past as negotiated through the performance texts of Samuel Beckett. 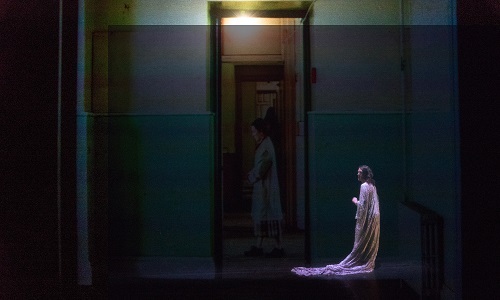 This use of the layering of imagery onstage, live, pre-recorded and text retained the path taken by the audiences as they journeyed through past and present, metaphorically and figuratively in the old houses of Halla Banba. Having been given the facility to work practically with the help of the Project staff we can now re-present the piece either as site-specific or within a theatre setting without compromising either iteration in any way. I cannot stress enough how important these weeks can be for the independent theatre sector.